These 5 small businesses all make their products in the U.S. and are committed to keeping things that way, despite the lure of outsourcing. 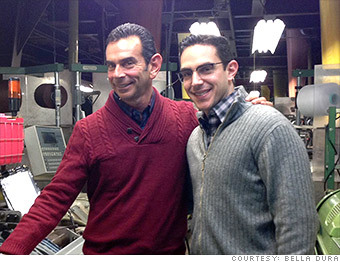 Third-generation owner Irwin Gasner with son Ari, who joined the mill in 2009. Few textile manufacturers are still operating in the United States, since cheaper imports make it hard for them to compete. But business is booming lately at the Wearbest Sil-Tex mill in Garfield, N.J. The firm's sales were up 52% last year, as the company has found new customers. Wearbest fabrics have been used for upholstery and drapery at luxury hotels, large restaurant chains like California Pizza Kitchen and Starbucks (SBUX), and even the White House. A commitment to keeping the firm's goods "Made in America" is central to the company, said owner Irwin Gasner. His grandfather started the business in the 1940s, opening a mill in East Rutherford, N.J. that made silk linings for high-end men's suits. After World War II, the business shifted its focus to making upholstery and other decorative fabrics for the home. The firm did well, and after Gasner took the helm in 1980, he moved to a bigger facility. But then, on Labor Day in 1985, a fire burned the mill to the ground. Despite the huge setback, the firm got loans that helped it get back in its own mill six months later. The recession delivered another blow: Sales dropped 40% and in 2009, the mill laid off half its employees. "It hasn't been an easy ride but we're back on track," said Gasner. To stay relevant, the firm focuses on creating innovative fabrics. Its latest invention: environmentally friendly, high-performance fabrics designed for high-traffic areas, like seating in hospital waiting rooms. "I constantly tell my team that there's no reason to exist if we can't get even better," he said. Do you have a business that makes its products in the USA? Is it thriving? What are the challenges? Email Parija Kavilanz and you could be included in an upcoming story.